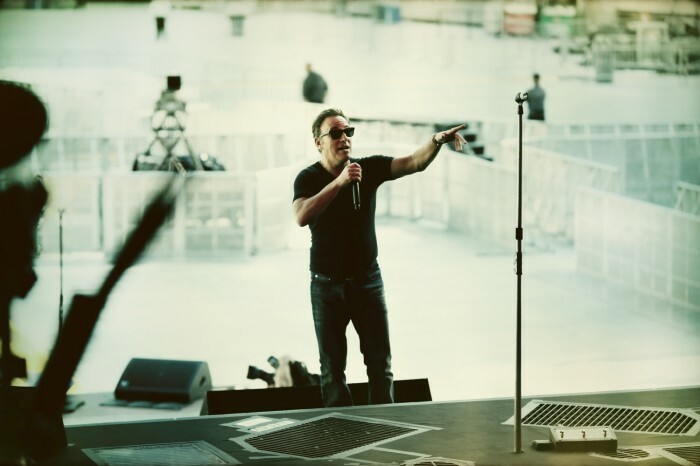 At Friday night's MetLife Stadium concert, Bruce and E Street began the show with "Living on the Edge of the World" and continued throughout to deliver hard-rocking New Jersey favorites. Anticipation was high due to the buildup of a record-breaking year of shows and a major performance on Wednesday night, and during the course of the 3 hour and 10 minute show, Bruce and the Band broke through our expectations with sheer soul. Delivering power early in the set was a double strike of "No Surrender" and "Lost in the Flood." "We Take Care of Our Own" saw Soozie and Gary playing strong to the Meadowlands pulse. After roll call, Gary U.S. Bonds came out to play "Jole Blon" and "This Little Girl." The crowd showed its appreciation by alternating between a reverent focus and ear-shattering cheers for Bruce's long time musical friend -- and Gary U.S. Bonds did not fail to reciprocate. "Incident on 57th Street" and "Rosalita" were presented in original form and sequence in a special nod to the home field. "Waiting on a Sunny Day" saw Bruce pull a young man into the spotlight, sporting an "I Rock" T-shirt, and yes little guy, you did. "Talk to Me" showed Ed and Max whipping Bruce into a frenzied state, with the man himself running in place and spinning on his back. Following up, Nils continued the madness, going face to face with Bruce to create a guitar explosion. On "Mary's Place," Cindy made us all join the choir with her, Curtis, Michelle and Everett, until our combined voices seeped into the concrete. The encore set showed Michelle and Bruce soaking in intimacy with the New Jersey crowd as the E Street Horns played their haunting parts to "Rocky Ground." Soon after Bruce pulled a blonde Jersey girl to the stage for some "Dancing in the Dark" with the E Street Band. "Bobby Jean" brought out the house party spirit that helps make up the E Street soul. "American Land" closed the show and threatened to bring down the stadium with both metaphorical and literal fireworks. Walking away on ether and clouds, there were only a few things that we could all be certain of: that Bruce had rocked the New Jersey yet again? An emphatic yes. That tomorrow night he would do it again? There's no stopping it. That Bruce Springsteen and the E Street Band brought us the soul and made us live in it, if only for the short time we were together? There's no denying it.